Pinterest is rapidly becoming the next best social media tool to make your business a success. Though it has yet to reign in as many users as the social media giants that are Facebook and Twitter, Pinterest is the new and fresh way to get your brand out there. What makes Pinterest such a success to drive a product derives from it’s pure focus on the visual, perfect for products, design and photography. An epi-centre of fresh new designs and ideas, your Pinterest profile showcases your interests. Whilst Facebook pioneered a mission for social media to forge relationships and links, Pinterest is an exchange of images and ideas. Easy to use, setting up a Pinterest won’t take weeks to master. You simply apply for an invite, making it abit more exclusive then your average social media site, and voila- there you have your Pinterest account! You can follow certain people, or just their boards so you received a constant stream of what they’re pinning and re-pinning. Whilst surfing the web you can pin anything you find interesting by using the pin button, bridging the gap between the Pinterest website and any other external websites where you might get your sources and pictures from. Driving the most traffic then any other social media site, Pins include a link to its source. This is a perfect opportunity for business’ to circulate traffic to their own websites, each time they pin something new. Interactivity is one of Pinterest’s winning features. Repins and pinning circulate a newsfeed of images on your follower’s home page. 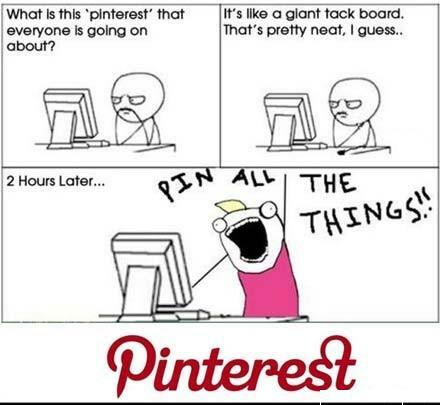 As a Pinterest user you’re in a prime position to explore other people’s likes, interests and ideas- constantly discovering something new and different. From a business’ point of view this is an advantageous position to be in; you effectively have access to your target audiences likes and interests, which is helpful in constructing your product to suit their tastes as well as tailoring advert campaigns. Pinterest is brilliant for driving exposure and maximising awareness! Pictures and visuals of products act as less intrusive advertisements; a new generation of advertising that is more about the circulation and celebration of great products rather then a million pound company thrusting advertisements in your face everywhere you turn. Pinterest is yet another social media outlet to which our business ventures and personal profile benefits from dramatically if you sue it correctly. Use regularly and often to receive the best results, the more interaction you have creates a strong online presence which is beneficial in terms of market research, creating a strong brand and creating more awareness! Hester Christmas works for No1 Traveller and CS Bedford, and helps manage company’s social media and Pinterest accounts. Hi, I do believe this is a great site. I stumbledupon it 😉 I’m going to revisit yet again since i have book-marked it. Money and freedom is the best way to change, may you be rich and continue to help other people.